We've looked at Funko's Marvel lineup, and the TV series they're covering in 2015. Now, it's time to go to the big screen with a day at the movies. We won't repeat the Age of Ultron figures already featured in the Marvel gallery – click the link above to see those – because there are more than enough other images to show you without them. Frozen is still a juggernaut for Disney, and a Funko rep told me at the show that it “has surprised even us, with how strong all these continue to sell.” Of course, that means there's a second wave of Frozen POP Vinyls coming, plus the just-debuted mini blind-box vinyls. Funko also told us there are “other waves in development,” and that likely, though they couldn't confirm, includes figures specifically based off the looks in the new short, Frozen Fever, premiering in front of the new live-action Cinderella (which also gets its first two POP figures, Cinderella and Gus Gus in the glass slipper. If that cuteness isn't enough for you, we'll stop burying the lede here: Harry Potter Vinyls are coming. The ones on display were hand-painted prototypes, something Funko doesn't usually show the public, let alone allow people to take pictures of, but the company was so excited to announce the new line that they went for it at the show. The first series features the obvious characters: Harry, Ron, Hermione, an over-sized Hagrid, and Professors Dumbledore and Snape. Funko also promised that yes, they have “many” waves of these figures on the way. “Now that we have the license, we're going to make a lot of these, if I had to guess,” a rep told me. Pixar's Inside Out and Cars get their own lines this year. Disney's Tomorrowland gets not just POP Vinyls, but also the “Reaction” figure line. Those figures are designed, built, and packaged similarly to the classic Kenner action figures, and this property is one of the first new lines in that brand. The Matrix and the Universal Monsters, plus Domo-style Ghostbuster round out the POP! Vinyl lineup for movies for 2015. There will be new Minions based on their summer film, but no pictures were allowed of those just yet. Other Reaction figures include Star Trek and Fifth Element. 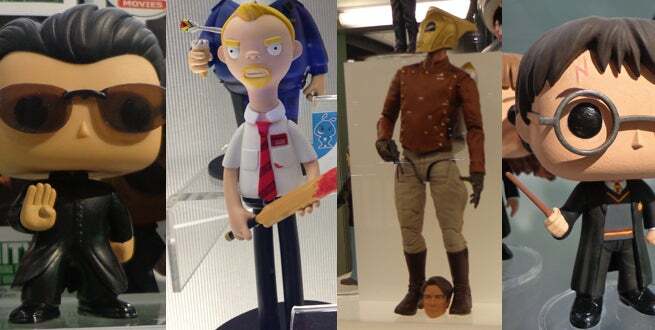 The new Vinyl Idolz line is almost entirely film-focused, with Ghostbusters, Back to the Future, and two thirds of the “Coronetto Trilogy,” Hot Fuzz and Shaun of the Dead all in action. Finally, the amazing Rocketeer legacy figure shows off Funko's high-end current action figure chops. Check out the gallery of film-focused Funko fun here, and start your Funko Fund now!